Stir-frying eggs was my very first cooking lesson ever. It was taught by my dad, just like most of the ‘first lessons’ in life he taught me. I was probably 6 years old, he held my hand, taught me this first cooking lesson, from how to light up a match, turn the gas switch nob, to how to crack an egg, get the eggs into the bowl, and how to beat the eggs with chopstick, to how to stir fry … When I grew up, after being able to cook independently, seeing him eat my food became one of the satisfying things in my life. But now, I am too far away from him, only wish I could cook for him all the time. There are many combinations when it comes to stir frying eggs. One of my favourite Northeastern Chinese dishes is stir fried eggs with ‘garlic sprouts’, (I checked up online, but there is apparently no such vegetable in the West). In Chinese, garlic sprouts are called Suan tai or ‘Suan Hao’. You can get them in any markets in Northern China. In Spain, my mother-in-law sometimes cooks garlic shoots, which taste very similar to ‘garlic sprouts’, but the texture is different. In fact asparagus combines quite nicely with stir fried eggs. 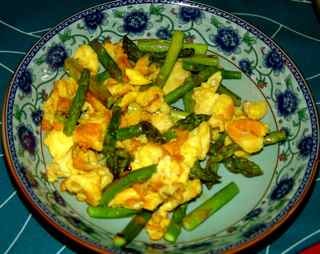 For example, asparagus omelette is quite popular in Spain. Also, three weeks ago, in Paris, in a smallest Korean restaurant you can imagine, they served an omelette dish, which looked very similar to Spanish ones, but with the whole asparagus, rather than chopped ones. The dish is very simple and light, no extra seasonings, just salt and vegetable/mushroom/chicken essence/msg (optional). 1) Beat around 2-3 eggs. 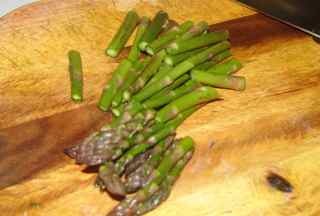 2) Wash and chop the asparagus into around 4cm. 1) In a heated wok, pour in around 3 tablespoons of oil, keep the fire medium strong. 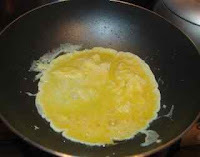 2) When the oil is hot, pour in well beat eggs, and keep on stir, so the eggs form up into smaller pieces. 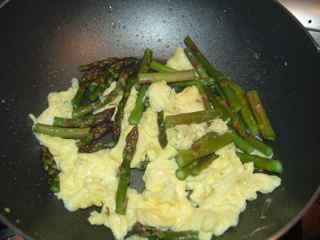 3) Then put chopped asparagus in and stir with eggs together. 4) Add in a few drops of cooking wine, 1/2 teaspoon of salt, 1/2 teaspoon of salt and vegetable/mushroom/chicken esstence/msg (optional).